AskAway is a virtual reference service designed to help college and university students get instant help with their research. AskAway provides library research help and support via chat for more than 65 hours each week. Librarians from around the province answer questions on aspects of the library research process – from finding articles and books on a topic to formatting citations in a completed assignment. The service is particularly useful for distance education students, off campus students and Library users who need help when the physical library might be closed. AskAway is available via the “Ask an Expert” tab on UBC Library’s homepage, or via direct link. 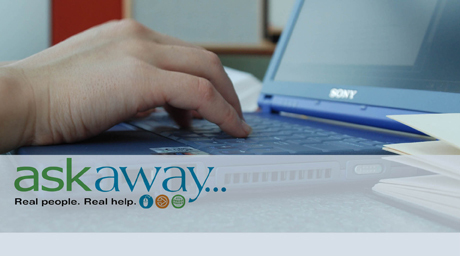 For help on how the service works, or information about the program, visit the AskAway website. AskAway is coordinated by the BC Electronic Library Network (BC ELN), with funding support from the Ministry of Advanced Education and BCcampus. The service is offered by 29 libraries at post-secondary institutions in BC, including UBC Library. For more information on AskAway province-wide, visit the BC ELN website. Sunday to Thursday 10 a.m. – 9 p.m.
Friday & Saturday 11 a.m. – 5 p.m. Looking around in “Academic Search Complete” or some other EbscoHOST database and suddenly need the help of a Librarian? Well, now you can get it. At the search result level within EbscoHOST databases (or at the article level, if you are browsing a journal), an AskAway box will pop up on the right. Don’t know what “AskAway” is? Read about it here.